The Ultimate Tea Diet harnesses tea's incredible weight-loss potential in a straightforward plan for losing weight in a safe and healthy way. Summary : The tea is ok, but not destined to become one of my favorites anytime soon due to a lack of strong flavor. Review : I really do my best to avoid having no preconceived notions about what a tea will taste like. Indeed, I didn't even start drinking hot tea until 2005 - at age 37! So, it's not like I have a huge reservoir of tea tasting experiences to draw upon. And so it was that I came across some stash English Breakfast Black Tea one night in my local supermarket bulks food section - sold individually, which is always nice on the wallet. Before I began drinking tea, I had an "image" of what tea would taste like. This image was fulfilled precisely in Stash's English Breakfast Black Tea. The tea itself, right out of the foil, had very little aroma - something I wasn't entirely use to since most teas I drink have a pretty strong aroma. The taste of this tea, well, its pretty much what I expected of tea when I first began drinking it. Not sweet, not tasteless, but rather a "hot beverage" with a different taste. Really, what this tea reminded me of, oddly, was unsweetened Iced Tea (something I'm not entirely fond of). In short, I found this tea nothing to write home about. Now, this probably isn't really the teas fault here. I do have a sweet tooth - no denying it. However, I can live without the "sweets", so I'm not totally strange. That said, I really DO require a robust flavor to something in order for me to like it (which is why Tofu is not on my list of favorite foods!). And I found this tea, well, rather lacking in the sweet category as well as the flavor category. Now, this tea DID have a strong taste to it. However, the taste of the tea wasn't flavorful - if you know the difference between the two. Then again, black tea really isn't supposed to be flavorful unless various things are added to it - so I shouldn't have been surprised by this little revelation as this tea consists of pure black tea leaves. So, who will like this tea? If you like a more traditional, non-sweet taste I think you'll like this tea. And if you like unsweetened iced tea, drop everything you're doing now and run out and get this tea as you will most definitely like it. However, if you are looking to satisfy your sweet tooth or to experience a new flavor, well, leave your money in your pocketbook as I don't think you'll enjoy this tea that much. This tea will be ok - you won't dump it down the drain - but it won't be very satisfying, either. Recommendation : If you like unsweetened iced tea, then this tea is for you - as the taste is nearly identical. Otherwise, find something else to sample. Brewing Instructions : Pour one cup boiling water over tea bag. Let steep 3-5 minutes. Lipton Honey Lemon Flavored Black Tea : A very flavorful honey and lemon flavored black tea that is pleasant to drink. Stash Nilgiri Black Tea : A very bitter and rather unpleasant bagged black tea. Lipton Orange & Spice Flavored Black Tea : A very tasty and enjoyable orange and cinnamon flavored black tea! 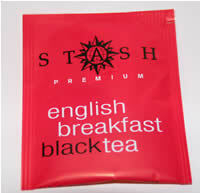 Stash English Breakfast Black Tea : A rather flavorless, but yet strong tasting, black tea - like unsweetened iced tea.